Scenic Hudson supports the necessary development of renewable energy sources in the Hudson Valley by providing best practices and facilitating dialogue between project developers, stakeholders and local communities. By reviewing these projects and negotiating site details, we will recommend that developers adopt the principles outlined in Clean Energy, Green Communities to ensure that risks to prime agricultural lands and conserved open space will be mitigated. In order to respond and adapt to rising sea levels, more frequent extreme weather events and other impacts of our changing climate, we must transition away from fossil fuels and toward clean energy alternatives. Taking this step requires a collaborative, concerted effort to reduce greenhouse gas emissions (GGE) and eliminate our reliance on fossil fuels. After automobile use, electricity generation is the largest source of GGE in the U.S.—68 percent of our electricity is produced using fossil fuels. Under Gov. Cuomo’s leadership, New York State has set ambitious goals to generate 50 percent of its electricity from renewable sources by 2030 and reduce GGE at least 80 percent by 2050. Reaching these benchmarks will require the development of new solar facilities, both large and small. For a region like the Hudson Valley—renowned for its beautiful open spaces, prime farmland, myriad opportunities for outdoor recreation and nationally important historic sites—determining the location of these projects must be carefully considered. 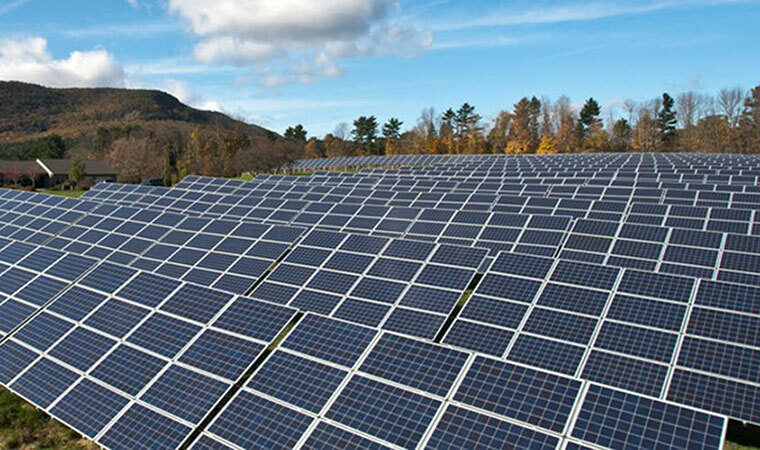 Scenic Hudson is currently evaluating several large-scale solar projects, weighing their public benefits against potential impacts. Consistent with our Clean Energy, Green Communities solar siting guide, these evaluations will help identify techniques to reduce the environmental and social impacts of these and similar facilities, while encouraging their construction when appropriately sited. All of these projects also will be evaluated under New York State’s Article 10 process. Hecate Energy has proposed building a 40-megawatt solar generating facility on a 428-acre site. The Preliminary Scoping Statement was submitted to the Public Service Commission in April. We are evaluating local visual impacts as well as impacts to the existing agricultural lands, currently being used for industrial purposes. For additional information, see the project website or the Public Involvement Program Plan. Hecate Energy also has proposed building a 50-megawatt solar generating facility on 890 acres. A Public Involvement Program Plan submitted in October 2017 provides a project summary and site details. Scenic Hudson submitted comments on the Preliminary Scoping Statement, where other interested parties also may file comments. Scenic Hudson currently is evaluating concerns over impacts to agricultural and visual resources as well as grassland bird habitat. We have formally intervened as a party to the Article 10 proceeding to ensure that the project minimizes or mitigates these impacts. For additional information, see the project website. Hudson Energy Development has proposed constructing a 100-megawatt solar generating facility. The Public Involvement Program Plan for this project was finalized in April, and a Public Scoping Statement is expected by the fall. The project is located to the southeast of Hecate Energy’s proposed project in Coxsackie. Scenic Hudson has intervened in the project’s Article 10 proceeding. May 2018 Article: "Hecate outlines plan for solar project in Coxsackie"